The paint you've previously known as Liquitex Medium Viscosity Acrylic Artist Color is now called Liquitex Professional Soft Body Acrylics. 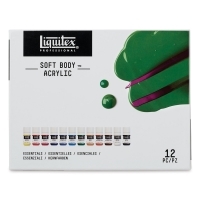 Liquitex Professional Soft Body Acrylics were the first fine artist's acrylics sold commercially in the United States. These concentrated acrylics contain rich, pure pigments that produce intense color without opacifiers or fillers. 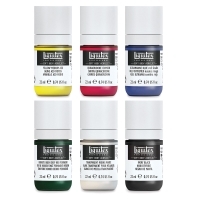 They have twice the covering power of ordinary craft acrylics! 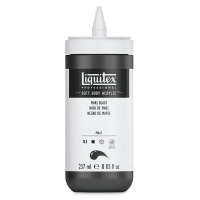 Liquitex Soft Body Acrylics are naturally creamy and fluid. That makes them just right for tole and decorative arts, stenciling, murals, silk-screening, calligraphy, printmaking, graphic design, sculpture, photo retouching, hard edged painting, watercolor techniques, fabric painting without heat setting, airbrush illustration... you name it! 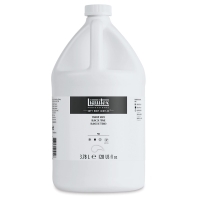 They're great for all surfaces, including wood, fabric, ceramics, canvas, or any porous surface. 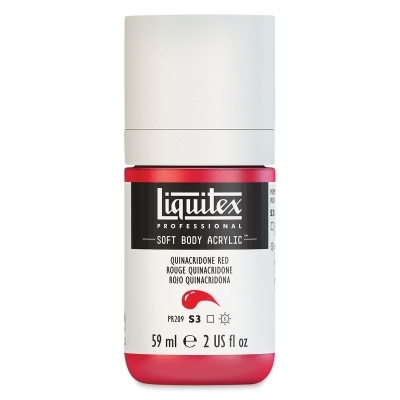 Now, Soft Body Acrylics come in ergonomic squeeze bottles with nozzle tips. They were designed with artists to be easier to use and more functional without wasting paint. 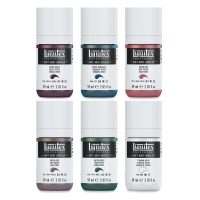 Muted Colors Set of 5 — This collection includes Muted Green, Muted Grey, Muted Pink, Muted Turquoise, and Muted Violet. 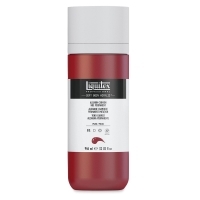 Individually, each color has a muted, subtle character. Together, the colors create a tonal palette. 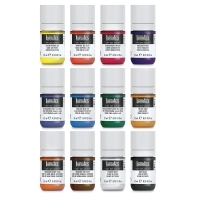 Essentials Set of 12 — This set includes 12, 22 ml bottles in Cerulean Blue Hue, Dioxazine Purple, Ivory Black, Naphthol Red Light, Phthalocyanine Green (Blue Shade), Quinacridone Crimson, Titanium White, Transparent Burnt Sienna, Transparent Raw Umber, Ultramarine Blue (Red Shade), Yellow Medium Azo, and Yellow Oxide. 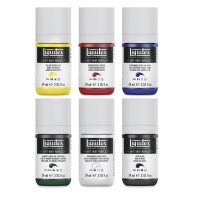 Mixing Set of 6 — This set includes six, 22 ml bottles in Hookers Green Deep Hue Permanent, Ivory Black, Quinacridone Crimson, Transparent Mixing White, Ultramarine Blue (Red Shade), and Yellow Medium Azo. 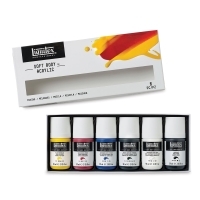 Mixing Set of 6 — This set includes six, 59 ml bottles in Hookers Green Deep Hue Permanent, Ivory Black, Quinacridone Crimson, Transparent Mixing White, Ultramarine Blue (Red Shade), and Yellow Medium Azo.